A Ft. Collins, Colorado toy company debuted its first line of eco-friendly toys this fall. Sprig Toys (www.sprigtoys.com ) has been in business for only 18 months but is already attracting national attention with its innovative line of battery free toy trucks. These trucks are made of child-safe composite recycled wood and reclaimed plastic called "sprig wood". The company uses minimal packaging. The toys are made in Canada rather than shipped a long distance from China. Sprig is in the process of making distribution deals with Toys R Us, Whole Foods, and independent toy dealers across the country. Chat Transcripts are a wonderful bonus of meeting in Second Life. All typed text can be copied, which results in 100% accuracy. Sometimes reading a transcript can be a bit confusing, though. When several avatars are typing at once, the conversation can seem somewhat disjointed. Around 15 avatars logged in, and engaged in the following lively conversations that you will read below. The meeting, tour, and sample program went very well, with a minimal amount of technical difficulties. All in all, a very successful first meeting for SLIG! [9:32] Plautia Corvale: Hi Max!! [9:32] Plautia Corvale: Take a seat! [9:32] Plautia Corvale: I'm Plautia Corvale, and I am the Technology Manager at the Mancos Public Library. I kept reading about Second Life and what Libraries where doing here, so I joined a little over a year ago, and have loved every moment of it! [9:33] Daisyblue Hefferman: is this the open to the public part? [9:33] Plautia Corvale: Hi Daisyblue!! [9:34] Moria Sugarplum: Hi, I'm the Director of the Mancos Public Library and this is my first time in Second Life. [9:34] Theophania Luminos accepted your inventory offer. [9:34] Daisyblue Hefferman: Kitty, could you rez me a sit prim, please? [9:34] Krull Aeon accepted your inventory offer. [9:34] Moria Sugarplum accepted your inventory offer. [9:34] Daisyblue Hefferman accepted your inventory offer. [9:34] Maxito Ricardo accepted your inventory offer. [9:34] Ariell Enoch accepted your inventory offer. [9:35] Midnight Mirajkar accepted your inventory offer. Thanks for coming! 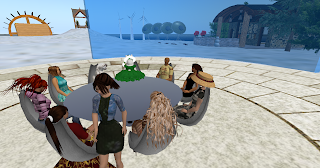 We're looking forward to working with you to make the Sustainable Living Library the best Library in Second Life. [9:36] Plautia Corvale: Today we'll start with a short informational meeting, and then take a tour of Emerald City and the Sustainable Living Library. [9:36] Plautia Corvale: Following the tour, we'll be giving a sample program, "Green Holidays". This should give you a taste of the educational opportunities available here in Second Life. [9:36] Plautia Corvale: We'll conclude with a Q and A session, and will also be setting a date and time for our next meeting. [9:36] Ashland Carter accepted your inventory offer. [9:37] Daisyblue Hefferman: I'm Daisy, a retired public library director. [9:37] Ariell Enoch: As Plautia said in her email, we want this to be a fun experience. So we don't want anyone to stand on formalities—just jump in if you have a question or thought. [9:37] Plautia Corvale: How many of you are new to Second Life? [9:37] Moria Sugarplum: I am very new! [9:38] Plautia Corvale: Great! Well, For those of you who are new, we'll be explaining things as we go. [9:38] Plautia Corvale: First, sometimes the chat can move quickly or be difficult to follow. You can open a chat window by hitting the Local Chat button in the bottom left of your screen. [9:38] Plautia Corvale: This will keep the chat up longer. [9:38] Ashland Carter: BTW. does Sustainable Director mean a higher level of SL? [9:39] Plautia Corvale: Take a seat! [9:40] Plautia Corvale: Sooshana, For those of you who are new, we'll be explaining things as we go. [9:41] Plautia Corvale: Today we'll start with a short informational meeting, and then take a tour of Emerald City and the Sustainable Living Library. Following the tour, we'll be giving a sample program, "Green Holidays". This should give you a taste of the educational opportunities available here in Second Life. We'll conclude with a Q and A session, and will also be setting a date and time for our next meeting. [9:41] Plautia Corvale: Also, when we begin the tour you can get lost from the group. Slow us down! [9:41] Plautia Corvale: You can make use of your mini map—follow the green dots and you can always find us or IM Ariell or myself. [9:41] Ariell Enoch: The last tour of Info Island I took, I relied totally on the mini map to keep up with the group : ) as we TPed from location to location. [9:42] Maxito Ricardo: the mini map is a big help when navigating to a meeting or group. [9:42] Maxito Ricardo: When they turn into green T's, that means they are higher or lower in elevation than you are. [9:43] Plautia Corvale: We'll be keeping a history of the "chats" from all our meetings. [9:44] Plautia Corvale: as will monthly "green tips", information relating to sustainable/green living, and upcoming programs of interest not only on Second Life, but RL as well. [9:44] Plautia Corvale: We want the blog to be informative and useful. [9:45] Ariell Enoch: We are also hoping that some of you will be interested in volunteering your time to work with us. An hour or two once a month would be great. As time goes on, our need for volunteers will increase as our programs, library, and outreach efforts grow. Volunteering is a good way of meeting people, learning more about Second Life, and it's a lot of fun. [9:45] Plautia Corvale: Hello, Mairin! [9:46] Maxito Ricardo: Daisy keeps getting bumped off her chair! [9:46] Mairin Vlodovic: hello! just woke up, sorry i am late! [9:47] Mairin Vlodovic accepted your inventory offer. [9:48] Shoshana Cardalines: It all seems quite confusing right now. [9:48] Maxito Ricardo: Shoshana, it takes awhile to feel comfortable in SL. [9:49] Theophania Luminos: And where else could we all get together for a face-to-face meeting without leaving the comfort of our usual places? [9:50] Maxito Ricardo: very true! [9:50] Maxito Ricardo: At a reasonable cost, too. [9:50] Plautia Corvale: You can meet in your pajamas, if you'd like, and no one will know! [9:50] Midnight Mirajkar: yeah, i am! [9:51] Plautia Corvale: We included the mission statement of the library in our last email, but was wondering if anyone had any questions or comments about it? [9:52] Plautia Corvale: The Sustainable Living Library of Second Life is committed to creating better and healthier lives for ourselves and our children through sustainable living practices. By developing workshops, exhibits and other resources, we strive to educate our visitors about green practices and other ways to sustain healthy lives and a healthy planet. [9:52] Moria Sugarplum: I'm not sure why I am Away - now it is gone. [9:53] Shoshana Cardalines: In order to use our voices do you just need to have a microphone and you press the talk button? [9:54] Plautia Corvale: So regarding the Mission Statement, We will base all our programs around this mission statement but are also planning to include mini workshops on SL skills. [9:55] Plautia Corvale: Does anyone have any other questions? [9:55] Theophania Luminos: Where do we send program ideas, or do we discuss them here? [9:56] Plautia Corvale: Do you have any ideas?! [9:56] Ashland Carter: Not yet, I need to get to know more about you! [9:57] Plautia Corvale: If anyone would like to lead programs, that would be wonderful! [9:59] Plautia Corvale: I am taking picures to record this momentous occasion! 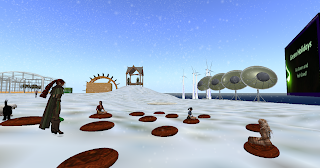 [9:59] Moria Sugarplum: We will doing sustainable living workshops at the Mancos Library after we move in our new library, so we could incorporate them in Second Life. [10:00] Plautia Corvale: Moria, that will be wonderful. I'm glad that we have so many interested and knowledgeable people! [10:02] Plautia Corvale: Let's start the tour. We'll come back to the library for our program and conclusion. [10:02] Daisyblue Hefferman: TY, Theo! [10:03] Daisyblue Hefferman: 'm usually a biggie, but was too busy to change yet today. [10:03] Theophania Luminos: I like the whole look. [10:04] Daisyblue Hefferman: it's fun, there's a terrific group of tinies here. [10:04] Theophania Luminos: can I find that on a search? [10:05] Shoshana Cardalines: Wow - this is great! [10:05] Daisyblue Hefferman: Krull, you outdid yourself with this build! [10:06] Midnight Mirajkar: love the xmas tree! [10:06] Plautia Corvale: hosting programs, etc. [10:06] Moria Sugarplum: This is beautiful. It looks similar to what our new library will look like. [10:06] Shoshana Cardalines: I wish we could afford this much stone! [10:06] Plautia Corvale: He is our master builder of this library! [10:07] Plautia Corvale: We sent him a small photo, and he built beyond our wildest dreams! [10:07] Plautia Corvale: Thank you , Krull!! [10:07] Midnight Mirajkar: very cool! [10:08] Plautia Corvale: Did anyone notice the photovoltaics on the roof? [10:09] Plautia Corvale: Yes, that is true, Krull! [10:10] Plautia Corvale: Does anyone have any questions about the library? [10:11] Ariell Enoch: shalll we move on? [10:11] Plautia Corvale: Yes, pleae! [10:11] Ashland Carter: what is the customer "test" not found? [10:12] Daisyblue Hefferman: uh, Krull has one that works. rofl. [10:12] Plautia Corvale: Krull, I'll have to get yours! [10:13] Plautia Corvale: Krull, would you like to talk about thewse? [10:14] Moria Sugarplum: Do they provide energy for everything on the island? [10:15] Moria Sugarplum: Are we planning on installing wind generators? [10:16] Shoshana Cardalines: I can hear it! [10:16] Moria Sugarplum: These are great! [10:18] Ashland Carter: What do the mean by sustainable gazebo? Made by "green" materials? [10:20] Moria Sugarplum: Is this a greenhouse? [10:22] Daisyblue Hefferman: Hi, Tedi! [10:22] Plautia Corvale: Hello Tedi! Glad you could make it! [10:23] Plautia Corvale: Let's take a look at that! [10:26] Midnight Mirajkar: sustainable Project Runway?! [10:26] Plautia Corvale: Exactly, Midnight! [10:30] Plautia Corvale: Krull, can you explain this, please? [10:32] Plautia Corvale: Does anyone have any questions? [10:33] Moria Sugarplum: The tour was fun and educational and I feel more at ease moving around. [10:33] Midnight Mirajkar: so what kind of events? [10:33] Shoshana Cardalines: Is there a place where I can get a list of tutorials so that I can get a better handle on how to function in SL before our next meeting. [10:34] Daisyblue Hefferman: go to Virtual Ability sim. [10:34] Plautia Corvale: Ariell will finish up, I will be going to get the program ready! [10:34] Daisyblue Hefferman: they run you through wonderful ones! [10:39] Plautia Corvale: Is the tour finished? [10:41] Plautia Corvale: Is the snow bothering anyone? [10:41] Shoshana Cardalines: I'm freezing ;0)! [10:44] Plautia Corvale: Can everyone see the slide show? [10:44] Shoshana Cardalines: Yes I can. [10:46] Daisyblue Hefferman: after you point at the slides first. sorry. [10:47] Plautia Corvale: The packaging is so tough - and kids are jumping up and down wanting to play with the toy!! [10:47] Plautia Corvale: We almost pull out our hair! [10:48] Plautia Corvale: And this lesser packaging means that kids can enjoy almost immediately!! [10:51] Plautia Corvale: Very sustainable, and memorable, too!! [10:52] Ashland Carter: Is this on Amazon? [10:52] Plautia Corvale: Sorry, is what on Amazon? [10:53] Ashland Carter: Buying an "experience"
[10:54] Plautia Corvale: Or, if you are using a newspaper, Make it more personal and relevant by matching the gift to the section. For example, you could wrap a cookbook with the food section or a children's game with the comics. [10:54] Bonnie Tomorrow: I love the maps idea! [10:56] Plautia Corvale: Theo and Shoshana, those are terrific ideas! [10:56] Shoshana Cardalines: I have used national geographic maps for wrapping. [10:56] Plautia Corvale: Fabric is a great one - it can be used again and again. [10:57] Bonnie Tomorrow: The silk was gorgeous too! [10:58] Bonnie Tomorrow: yes, and we will be having the terrific grocery bags again this coming year. [10:58] Plautia Corvale: She wrapped it in a satin ribbon, and then glued on old buttons! [10:59] Theophania Luminos: A use for the packaging you do get with things. . .
[10:59] Daisyblue Hefferman: my cats would rather play with packaging than toys. [11:00] Plautia Corvale: My boys, too, Daisy. [11:00] Plautia Corvale: That's always the way! [11:01] Kestrel Kytori: Ugh, yes. [11:03] Shoshana Cardalines: One of my favorite gift ideas, which uses no packaging, is to give to a charity in honor of the person I want to gift. Many charities make this very easy on-line. Heifer International and Kiva are two of my favorites. [11:03] Plautia Corvale: And what would the Holidays be without Food???!!!! [11:03] Bonnie Tomorrow: yay Food!!!! [11:04] Shoshana Cardalines: Sorry I went back to an old subject but I have to leave and I wanted to mention that. Thanks for the presentation and tour - I look forward to working on this project. [11:05] Kestrel Kytori: Thanks for elaborating on that- I didn't know what micro-lending meant. [11:05] Daisyblue Hefferman: Kiva is in sl, too. [11:06] Plautia Corvale: Shoshana, thank you for coming! [11:07] Plautia Corvale: Host a sustainable dinner party or healthy "pot luck" over the holidays with organic recipes and locally grown food. [11:08] Daisyblue Hefferman: TY, Plautia, that was terrific! [11:08] Bonnie Tomorrow: This was so much fun!!! [11:08] Ashland Carter: I enjoyed it too. [11:09] Kestrel Kytori: Was that www.sustainabletable.com? [11:09] Theophania Luminos: Will you be archiving this presentation somewhere in SL so visitors can view it? [11:09] Plautia Corvale: one moment! [11:09] Bonnie Tomorrow: so the next meeting is the first Saturday at 10? [11:12] Bonnie Tomorrow: Plautia, Ariell, are you planning on presenting again this coming year? [11:12] Theophania Luminos: I suggest going with the first Saturday this time, then solicit opinions for future meetings. [11:13] Plautia Corvale: Thanks for coming, everyone! [11:13] Ariell Enoch: Thanks, this was a great meeting!